CHICAGO -- The American Academy of Pediatrics (AAP) is launching a major new initiative in its fight against childhood obesity, focusing on both prevention and treatment of what has become a major threat to children’s health in the U.S. The new AAP Institute for Healthy Childhood Weight, to be launched Oct. 20-23 at the AAP National Conference & Exhibition in New Orleans, will lead the academy’s efforts in providing pediatricians, families and communities with evidence-based resources to help prevent and treat childhood obesity. The Institute, housed within the AAP, will be funded by a diverse base of corporate sponsors and grants from government and foundations that understand and support the mission and vision of the Institute. As the founding sponsor, Nestlé is providing the substantial funding required to launch the Institute. The Institute will focus on translating policies, best practices and emerging scientific evidence into practical solutions for health care providers, communities and individual families. For example, earlier this year the AAP released the Healthy Active Living for Families resources, based on research the AAP conducted with parents of young children to learn what type of nutrition and exercise guidance they would welcome. 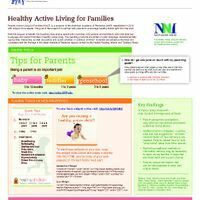 The project, supported in part by a grant from Nestlé, created a set of tools on HealthyChildren.org, the AAP website for parents, which offers families interactive features, quizzes and personalized tips to help them make healthy choices around nutrition and exercise for children from birth to age 5. The project will be demonstrated at the Academy’s meeting in New Orleans Sunday, Oct. 21, and can be seen at www.healthychildren.org/growinghealthy. For pediatricians, the AAP developed the Pediatric ePractice: Optimizing Your Obesity Care, a new virtual office platform funded by a grant from United Health Foundation that showcases all the resources pediatric practices need to conduct obesity prevention, assessment, and treatment. Many organizations are playing vital roles in the field of obesity prevention; the AAP will fill an important gap by focusing on the health of all children, including those 30 percent who are already overweight and obese. Nestlé, the world's leading Nutrition, Health and Wellness company, enhances lives by offering tasty and healthy food and beverage choices for all stages of life and at any time of the day. Its founding sponsorship of the AAP Institute is one of many initiatives that embody its commitment to Creating Shared Value. The company's U.S. business units include Nestlé Nutrition, Nestlé USA, Nestlé Waters, Nestlé Purina, Nestlé Health Science and Nestlé Professional. For more information, visit www.nestle.com/CSV/Pages/Homepage.aspx.